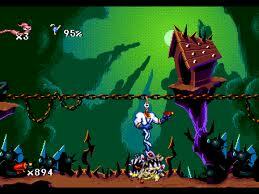 So I decided to play Earthworm Jim on the SNES which is a standard platform game of the nineties, having not played it for a few years, the next four hours of my life were very frustrating and I didn’t get far! 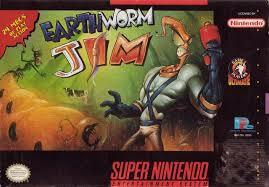 You are a worm and you’re called Jim, that’s all I can fathom from it. You just press start and you’re straight into the first level “New Junk City” No cut scene or animation, I miss this in most modern games where you have to wait five minutes for the actual game to start. So you have a Blaster gun, and a whip (you actually use yourself as a whip!) as weapons, and they are instantly in use to kill crows, crazy dogs (that seem to act more like the Tasmanian Devil), and men with briefcases!!! Having had this game for nearly 20 years I always struggled to get through the first level! Today, nothing had changed! It took me an hour just to get to stage 2. 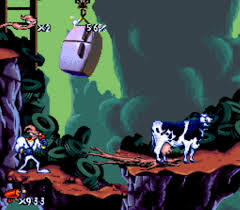 One of the things I did remember from my attempts at Earthworm Jim in the past is the Cow Launched, where you have to whip above a fridge dangling above a wooden log that is under a cow. The fridge drops and the cow disappears off the screen, I never knew why! It’s a bit bizarre but so is the game. Earthworm Jim is pretty simple to play with only three buttons to contend with, but I found it is one of the most frustrating games I have played and you will die countless times. The most entertaining part; or relief of it is, “Andy Asteroids” which is a race in a wormhole tube collecting bubbles and avoiding asteroids. If you’re lucky you’ll hear Jim shout “Whoa Nelly!” when you get a boost, which still, after all these years makes me laugh. Eventually (Fours hours later) I had only got as far as stage 4 “Tube Race” and 4 continues later and a game over I caved in and found a full walk through on Youtube. The guy completes it in 45 minutes! It’s the only way I’m going to see the ending! The music is fantastic on each stage, creating tension which is not especially helpful as you are already tense! or near death! The nineties synth beats, and upbeat tempo keyboard tracks keep your speed up and force you to never let up. The backing to “Andy Asteroids” is banjo duelling comedy which is great with the Whoa Nelly. Visually it still looks great, it’s not a blocky pixel game at all and it all runs smoothly with both vibrant levels as well as some dark levels. I have played a lot of games on later consoles that just don’t look as smooth, still, credit to Nintendo and the its 16 bit glory. Having frustrated me for hours, I can now do the first stage in about 5 minutes. It is a solid and difficult game to play but hasn’t deterred me to play it again and maybe one day I will complete it. Just wrote a review on this one. Gotta be my favorite SNES platformer next to games like Super Mario World and Yoshi’s Island. It can be brutal though! Cool to see somebody else’s perspective on it. Yeah, everytime I play it I miss one in the Forest and one in Chocolate Island. Everytime. Did you beat Special on Star World? That’s some challenging platforming right there. Did all the specials, just can’t find what I missed! Need to redo every level again!!! Haha, I love this game! I always liked the 2nd level (especially the music!). The tube race level really pissed me off though! I used to always use a cheat code to get to the Debug menu where you could select any level you want! 😉 This game is really funny, but it is definitely brutal.